The Unicorn have always been outsiders in Rokugan, but tensions between the clan that rides and the rest of the Emerald Empire are higher than ever. Though the Unicorn could not lay a claim to Toshi Ranbo, an attack led by Shinjo Shono has captured Hisu Mori Mura and its adjoining fortification, Hisu Mori Toride, back from the Lion. Rokugan is changing faster than ever, and it will take strong leadership for the Unicorn to maintain a position of power. Join us today for a letter from Unicorn Clan Champion Shinjo Altansarnai and the repercussions it will have during the upcoming Winter Court! The letter details the challenges facing the Unicorn Clan, and can be downloaded here (6.6 MB)! After you’ve read the letter, continue on for an examination of the story choice facing the Unicorn Clan at the upcoming Winter Court! 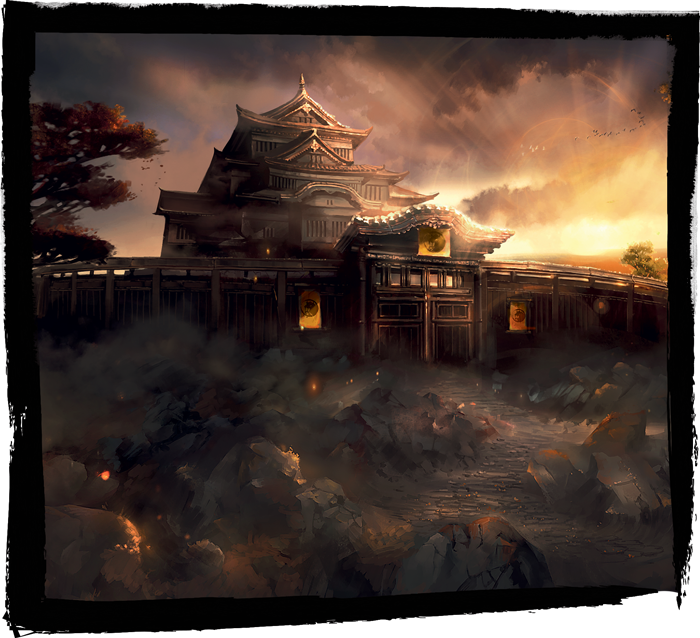 In the wake of Shinjo Shono’s newest assignment, the town of Hisu Mori Mura (and its adjoining fortification, Hisu Mori Toride) is in need of a steward. At the 2018 Winter Court World Championships, the top performing Unicorn player will be given the opportunity to choose what kind of samurai (by family) is to be put in charge of managing that fortification and its associated village. Should a Unicorn player earn the title of Shogun, they will have the oppurtunity to recommend a specific samurai to serve as steward! If selected, a samurai of the Shinjo Family rules the village with compassion and open-mindedness. If selected, a samurai of the Iuchi Family commands the spirits of the land to bolster the village’s defenses. If selected, a samurai of the Ide Family transforms the village into a vibrant center of trade. If selected, a samurai of the Utaku Family instills honor upon the village’s inhabitants by ensuring the tenets of Bushidō are strictly followed by all. If selected, a samurai of the Moto Family rules in the style of their ancestors, bringing foreign traditions to the people of the village. What will the future of Hisu Mori Mura be? The choice is solely in the hands of your clan’s best representative. Who will have the wisdom to choose a proper path? Find Fantasy Flight Games on Twitter to voice your support for a family, and tune in on Twitch November 1 – 4 to discover the fate of the Unicorn at the 2018 Winter Court World Championship. This is just the first of seven letters from the Clan Champions. Join us every Wednesday and Friday for additional letters as we prepare for a most contentious Winter Court!